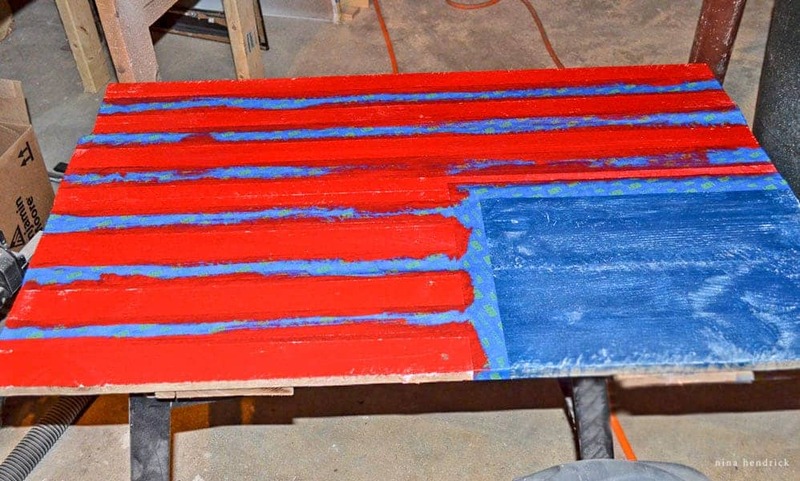 DIY Patriotic Wood American Flag | Learn how to make a Patriotic Wood American Flag from pallet wood with this step-by-step tutorial. 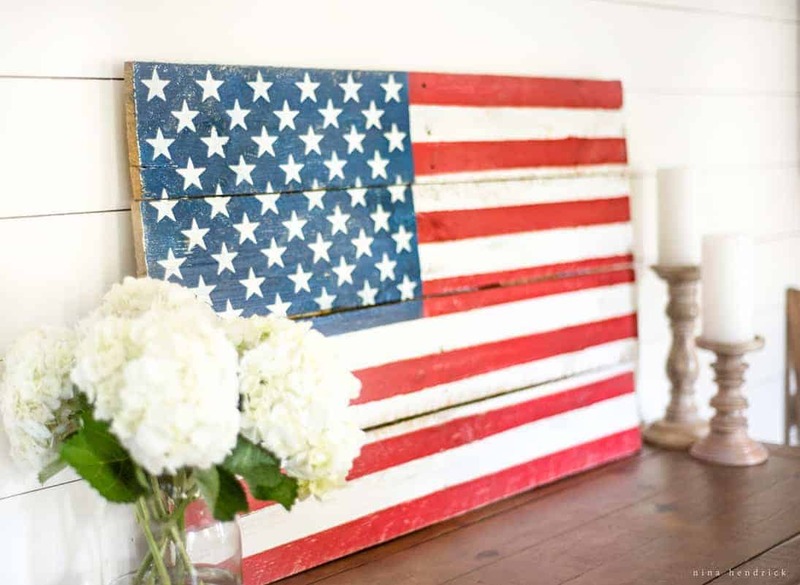 For years I have been looking for a way to add a rustic and patriotic wood American flag to my decor in a way that both fits with my style and is affordable. I decided the best way to get what I was looking for was to make one myself. This American flag wall decor is made with (untreated) pallet wood and leftover paint, so it was virtually free. Before we start, I should mention that this was not a precise project. I have rounded to the nearest even dimension to make things easier for you in recreating the piece. My pallet boards were warped like crazy, so there was no way I was ever getting it perfect. I embraced the imperfection. I like the call this look “Colonial Tavern”. There are gaps, cracks, rough cut marks, and knots. I love that look! 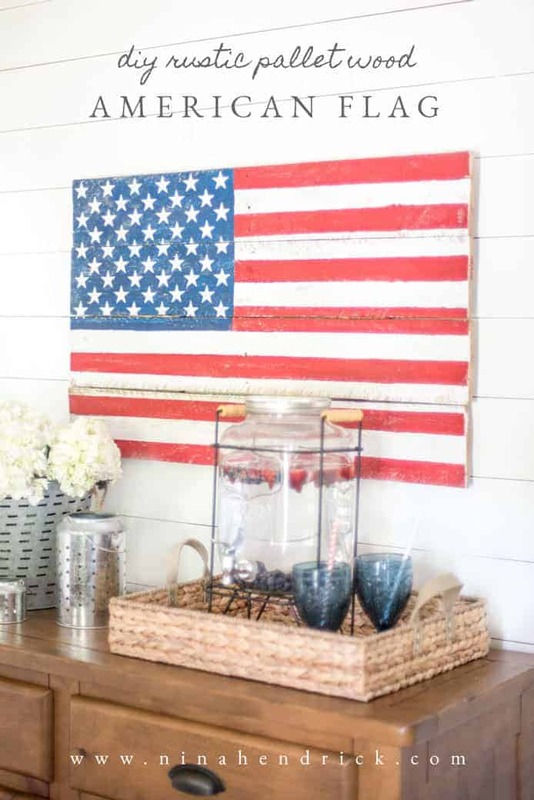 For more inspiration, you can check out the rest of my Patriotic Summer Dining Room here. 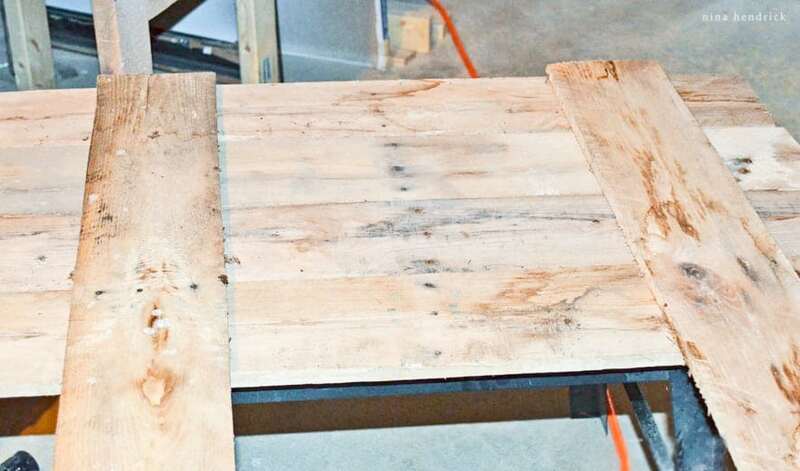 4- 1x6x8 Pine Boards (cut list follows) If using pallet wood, 6 boards at least 36” long. I started out by gathering my materials. I knew I wanted this to be fairly substantial, so I found my longest boards. Six were used in total. Four to make up the flag, and two for the back support brackets. I do want to mention that these were untreated raw pallets. I know there’s some concern over pallets treated with chemicals, but that was not the case here. I cut the two pieces down to 22” for the back supports. I left the front boards at slightly varying lengths to add character, but they are all around 36”. Next, I laid them out and made sure they were flush on one side (the left side of the flag). I decided which side of the board I wanted to face downward (which would be the front of the flag). I didn’t worry about the spacing between boards. They were far from perfect, and I had already accepted that there would be gaps! Finally, I lined up the back brackets and attached them using wood screws. 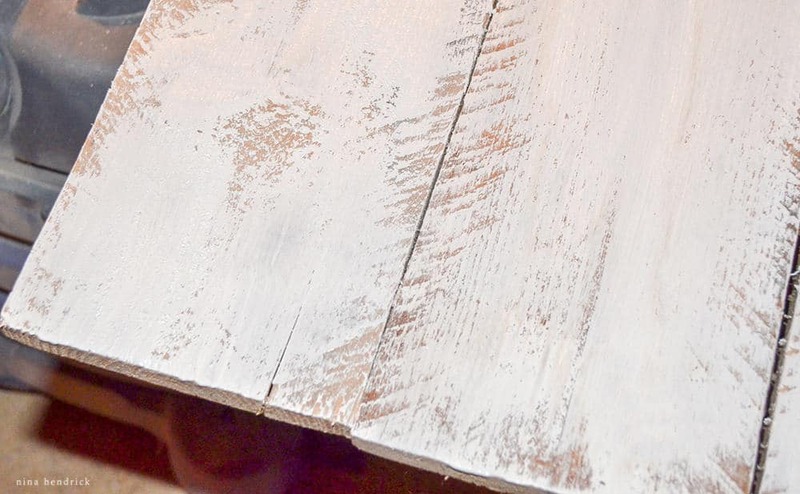 Note: The best policy, especially with dry wood like pallets is to pre-drill the holes so the boards don’t crack. I skipped this step because I wasn’t worried if boards cracked a bit. Luckily just the right amount of cracking and splitting happened. After the whole thing was solid, I gave the whole flag a light sanding with a 120 sanding block. 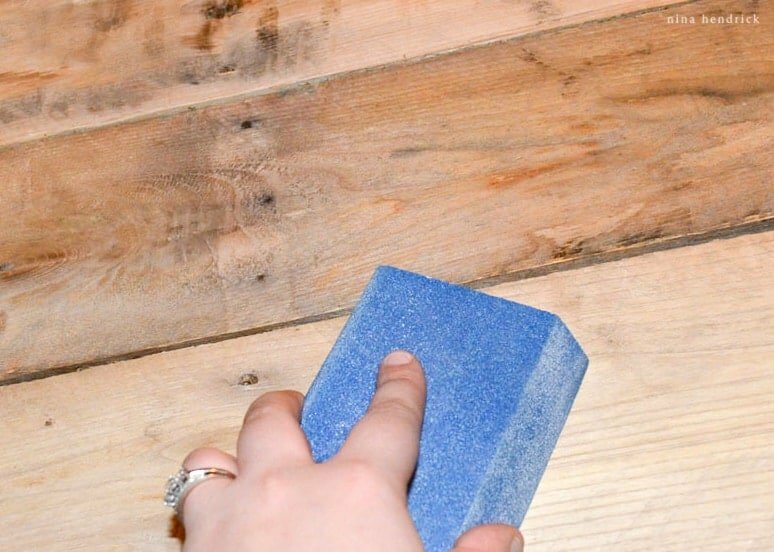 Just enough to get rid of the grime and splinters without going down to a fresh layer of wood. 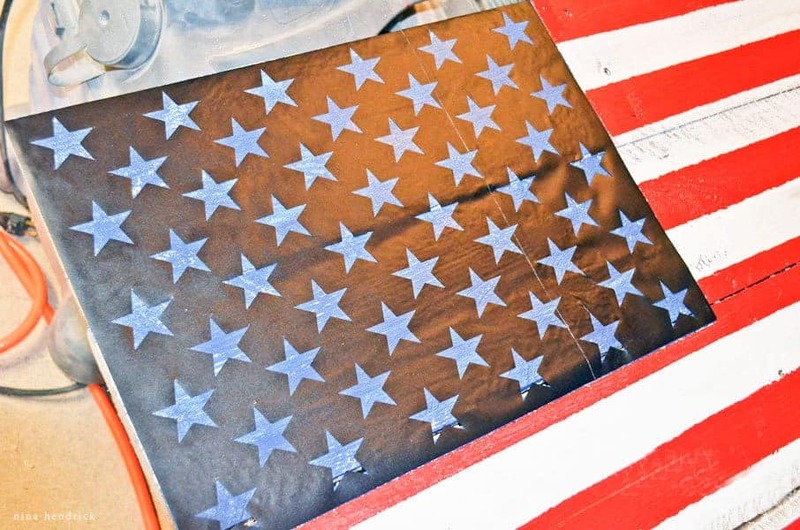 Next, I applied a light coat of whitewash to the whole front of the flag with some plain white latex paint. The key is to mostly dry brush this. Although this will make up the stripes, I intended for it to have a lot of wood grain showing through. Once the white paint was dry, I measured out and painted the blue area (painting over the white in that corner) which is approximately 12×16”. Once that was dry, I taped off to create the stripes. I used 1.5″ painters tape, but had to layer two pieces as my stripes had to be slightly wider. Each stripe is approximately 1.75”. I painted the red with another paint sample we had kicking around. Since the pallet wood is so rough, there was some unavoidable bleeding under the tape. Then, it was time to add the stars. I sanded a bit first to allow more of the grain to show through the blue. I created a vinyl stencil with my vinyl cutting machine and applied it to the blue area. However, I found this handy stencil for you that’s already made and is pretty close in size. You’ll just have to make sure to center the stars on the blue area, and it will work perfectly! Then, I very carefully dabbed white paint with a foam brush to create the stars. I wanted these to be fairly crisp. Once those were dry I removed the vinyl and touched up where needed. I succeeded, and was riding the adrenaline rush of a completed project… but then I noticed that I had goofed. 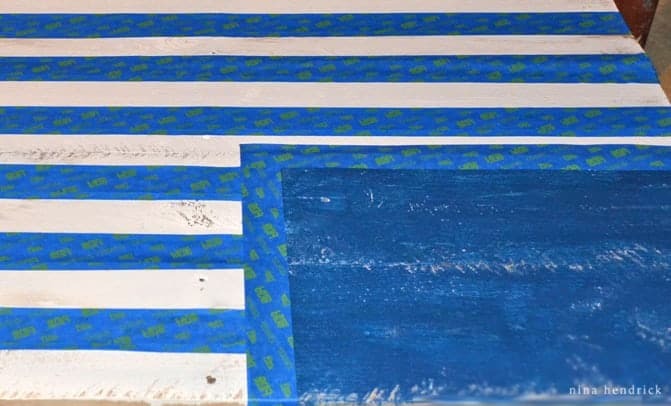 While laying out the stripes I was so busy worrying about the proportions according to USFlag.org that I missed that the red stripe does not extend past the bottom of the blue area. So, I fixed my goof with a sponge brush and more blue paint. All better! After letting it also sit overnight, I went back over it with the sanding block, distressing where it seemed to need it. Sanding also helped blend in the edges of the different colors. Then I gave it a coat of clear finishing wax. There it is! I am so excited to finally have a patriotic accent in my decor. 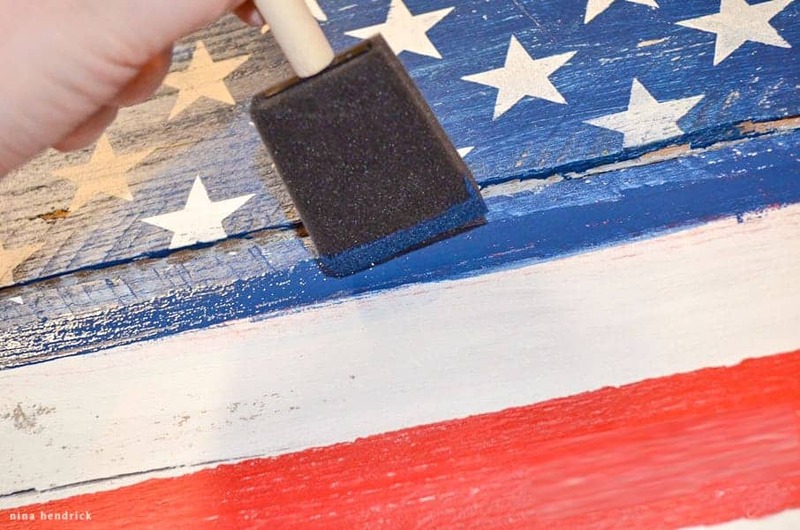 This DIY Patriotic Wood American Flag is perfect for Memorial Day and 4th of July. I hope that you enjoyed this project and would love to see a photo of your completed flag! 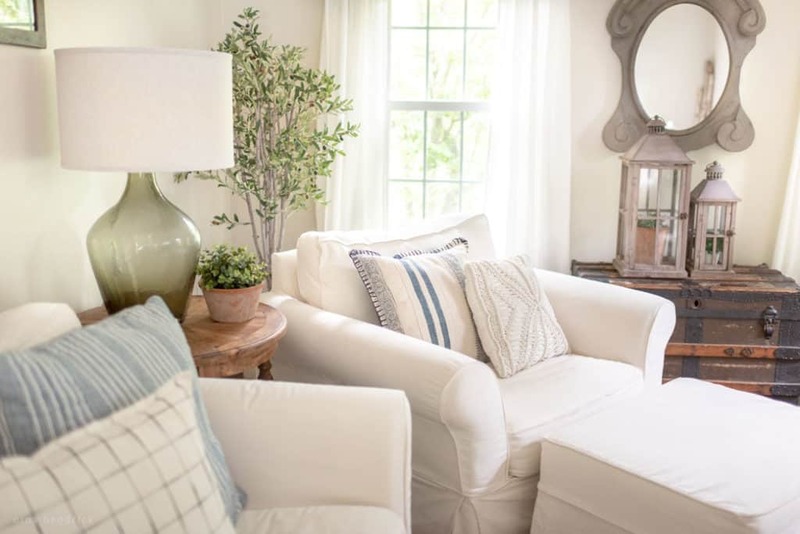 For more summer project, decor, and entertaining ideas you can click here. 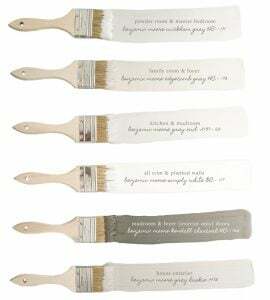 Last but not least, If you’re more of a shopper than a DIYer, there are some great handmade options here! You can support a handmade seller and still get your perfect rustic and patriotic piece. Great tutorial! I make a Canadian version of this flag and give one to any host during the summer. Always a hit. Looks like a fun project, and it turned out great! Perfect for the summer months. I really love this idea. Nothing feels better than a little patriotism on memorial day. I think it turned out really well, the stencil of the stars is perfect. This is something I can definitely try. Thanks for sharing. Really a nice idea there Nina, and to add it, you have added some patriotism into the wooden pallets. I also got lots of wooden pallets and wooden crates laying in the backyard and I think it’s time to put them into use. Thanks for the inspirations. 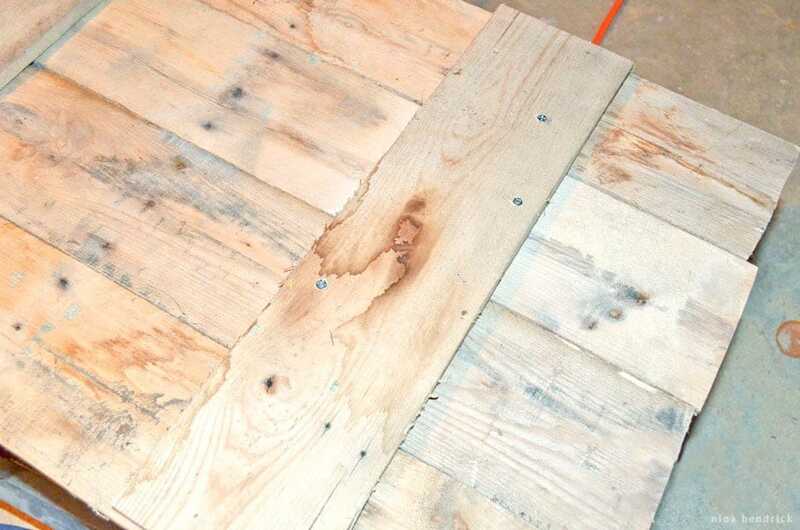 The perfect pallet project! Love it! I really like your pallet project. I especially like it because my birthday is the fourth of July. Thanks for the inspiration. You did such a great job with this! I like the idea of using vinyl to get the stars so crisp. I really want to try this! Pinned! I Give it two thumbs up! Very Nice !! !